I had the week of September 13th all planned. It was my birthday week so happy hours, brunches, friends and my yearly haircut were all on the calendar. I had everything planned around M-Pig, she was due to farrow (give birth) the 16th. 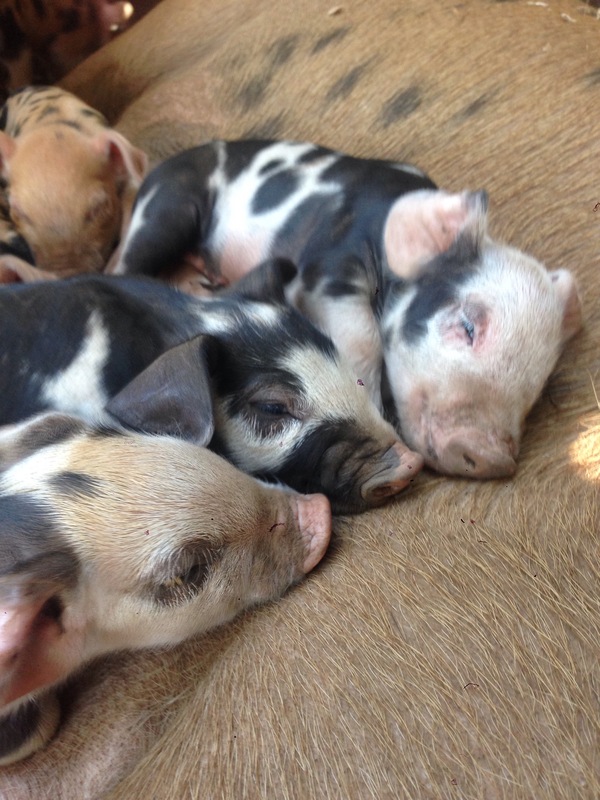 Brand new piglets! Fresh from the oven. But the best laid plans are often foiled, especially when animals are involved. M-Pig acted like she was ready to farrow in the 16th, she had milk, she was off her feed, she was HUGE! 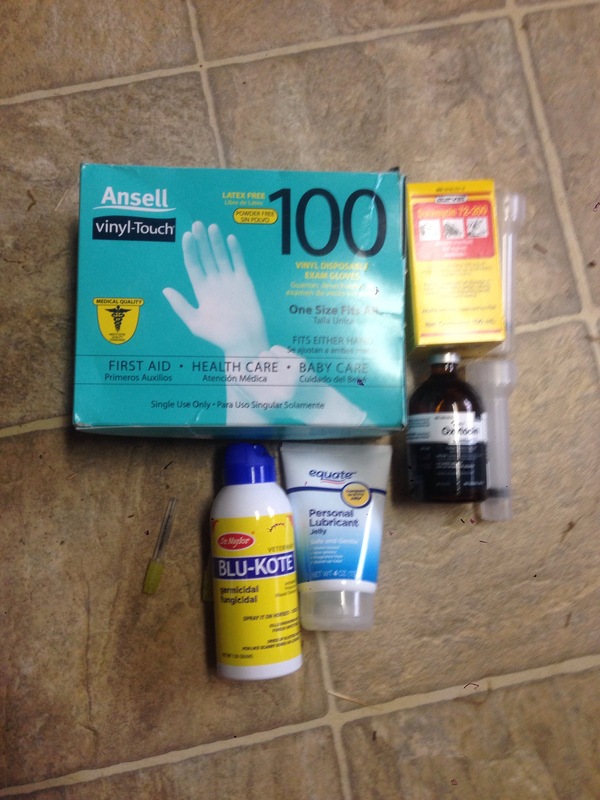 I was ready! But…nothing. I was ok with this because I figured she was going to wait and have them on my birthday, because that is the kind of pig she is, so kind and thoughtful. However, the 17th went by and nothing, then 18th (my birthday! ), and most of the 19th. Birthday dinner was postponed, as were the happy hours and brunches. Finally, mid-morning of the 19th, M-Pig’s demeanor changed drastically. She no longer wanted to eat the past the prime peaches Noble Orchards (thanks guys, the pigs loved them!) donated to the cause, she didn’t want to have belly rubs, she just wanted to sleep in her nest. I figured she’d start to farrow as soon as it got dark. She did. My first pig selfie. I look exhausted because I am. I knew it was going to be a long night for everyone involved. 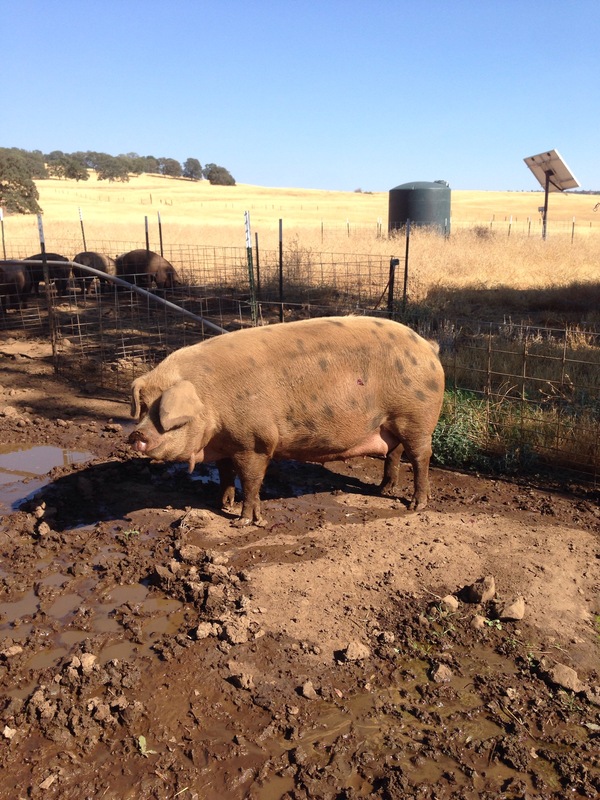 This was M-Pig’s and my, first time farrowing. 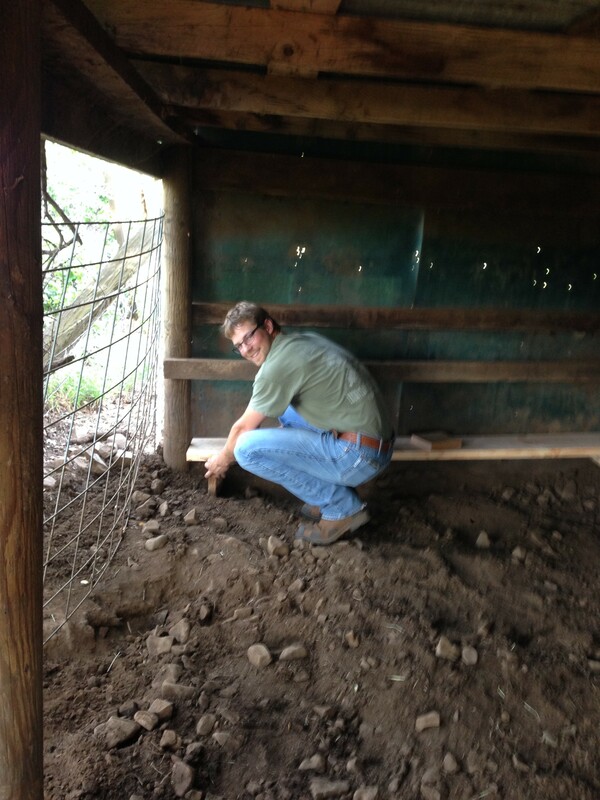 I’ve helped lots of cows do it, but this was my first pig and I was scared! 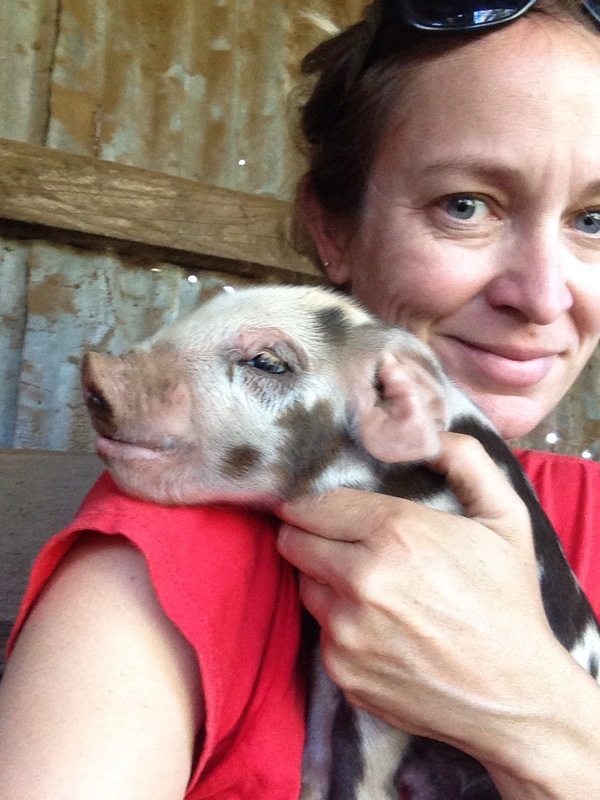 I really like M-Pig and did my best to learn everything I could about this process so I could help her if she needed it. But M-Pig was a total champ about the whole thing. 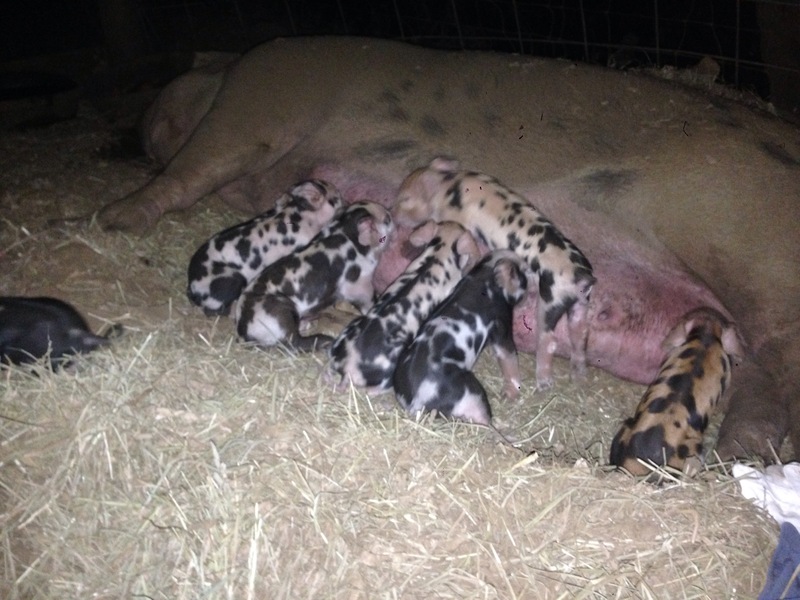 She had her first 7 piglets within a few hours, with no help at all. 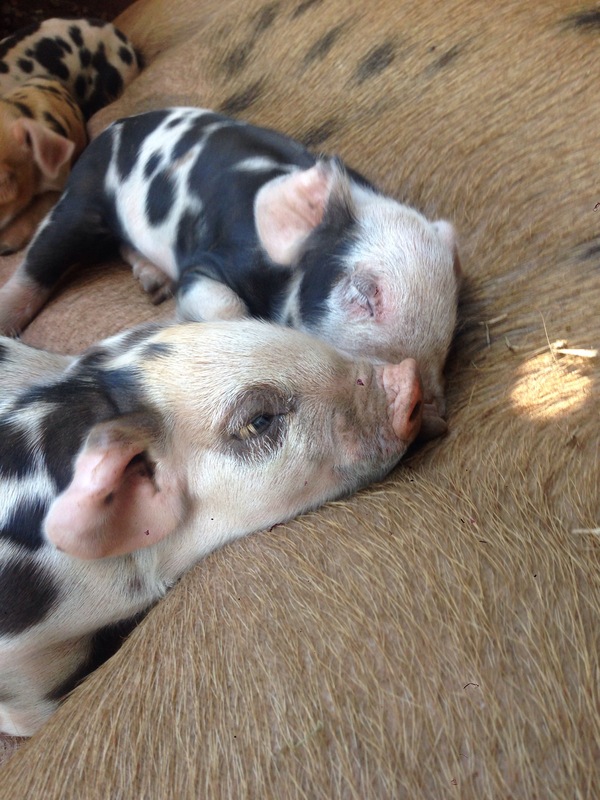 It was amazing watching these tiny, little, spotted piglets enter the world. 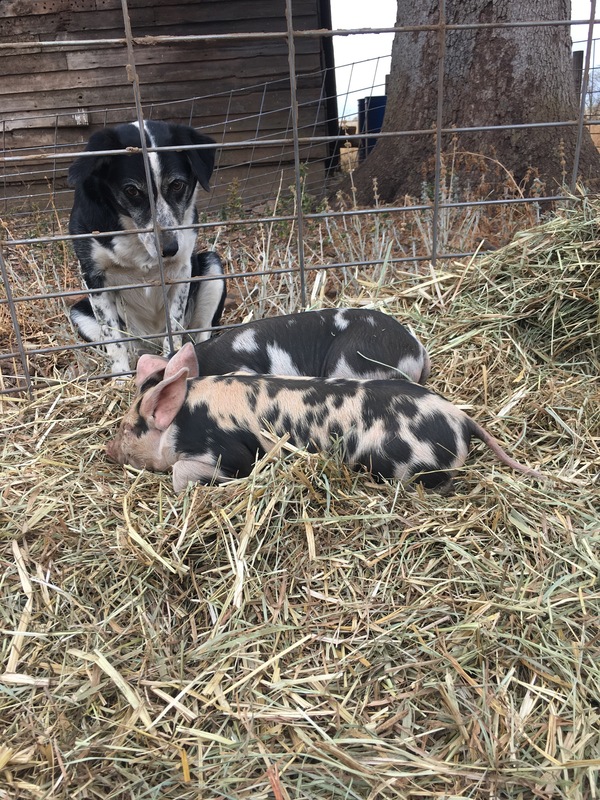 The last two piglets took longer and were both born dead. I tried to revive them like we do with baby calves, but I had no luck. Aunt Hoot dog was very worried about these little pigs! 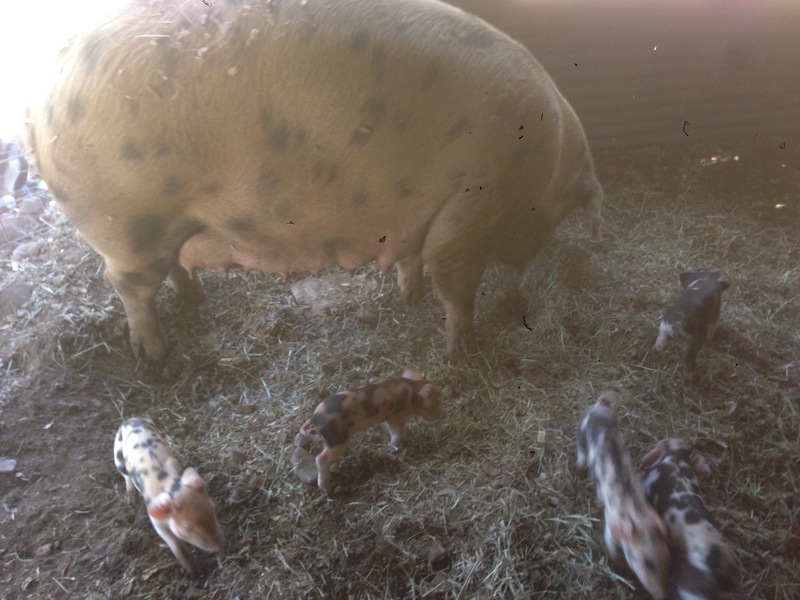 I stayed with M-Pig and her piglets until all the afterbirth had been passed and they seemed to be settled in and happy. I kinda felt like I was in college again, pulling an all nighter because I didn’t finish a project in time (I’m too old for that now, it hurt!). 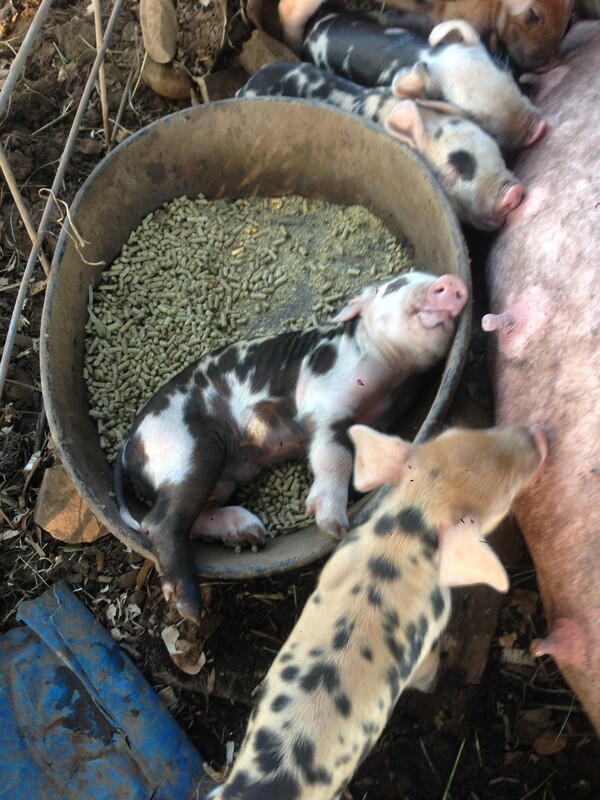 A milk drunk piglet. Don’t worry little guy, we’ve all been there. I made sure M-Pig was up, eating and drinking before I went to bed. That has actually been the most challenging part. 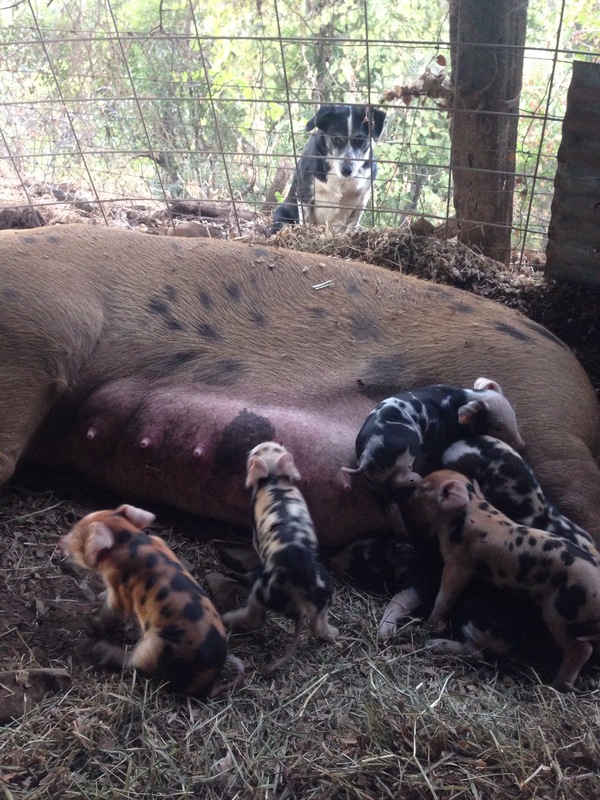 She is so focused on being a Mama and not squishing her piglets, she stays frozen when her babies are around her. She is getting better about it though! This morning she was asking for breakfast and got up all on her own. Getting M-Pig up to eat and drink. Stay tuned Beefjar readers, there will be many more pigtures to come! 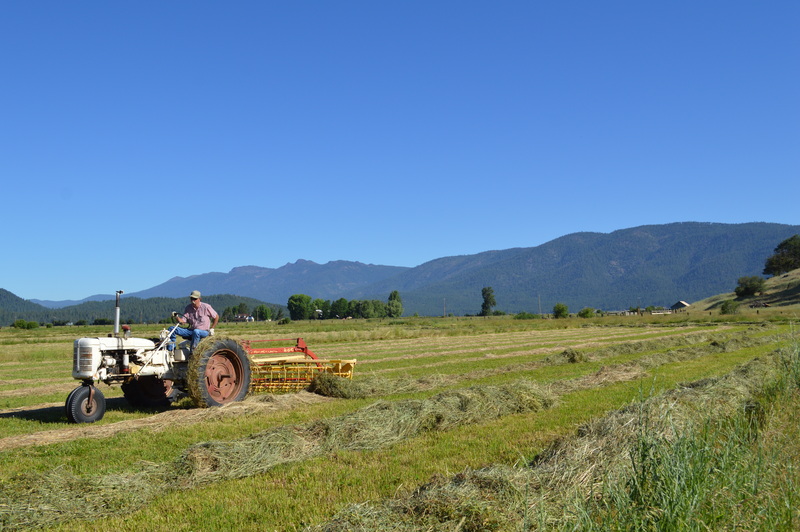 And a few ranch days for those of you that live in the area!